Least tern chicks need small fish to survive. 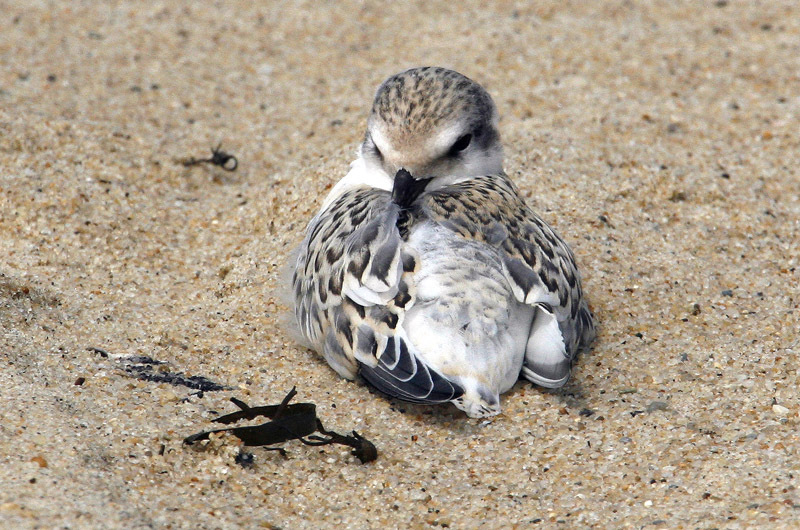 It is July and tern chicks are abundant in their nesting colonies. We have four species of terns nesting on the Island — least, common and roseate terns, and the black skimmer. 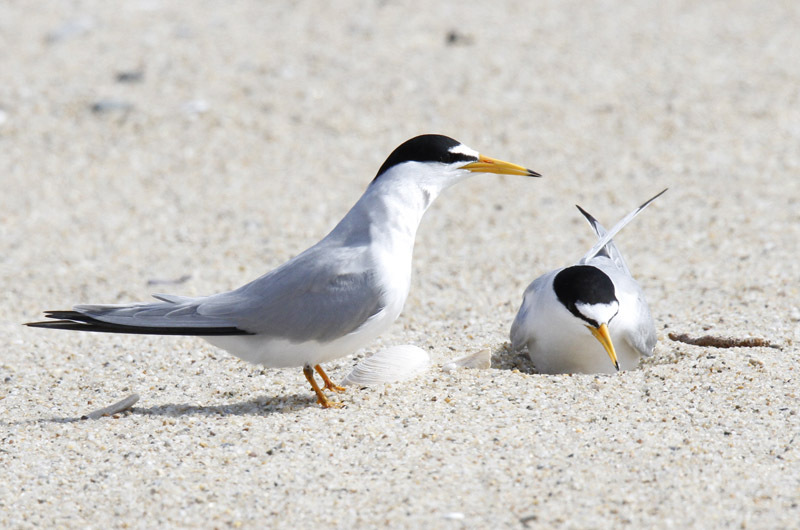 Not surprising by their names, the least tern is the smallest. Oddly enough, it is also more common than the common tern. Adult terns leave the chicks in the colony area to go fishing; they bring small fish back to feed their chicks. In good years, when small fish are abundant, the adults do not have to travel very far to catch the fish. In lean years the adults have to travel further to catch the fish so they bring fewer back to the colony. The chicks then eat less, grow slower, and fewer survive to fledging. Two of the main fish the least terns depend on are sand lance and silversides. Both are very narrow-bodied species, so it is easier for the chicks to swallow them. Yet we know little about either species. Research from Stellwagen Bank National Marine Sanctuary — in the Atlantic Ocean north of Provincetown — has shown that the small sand lance are critical to the presence of most seabirds and marine mammals. When these small fish are abundant, the seabirds and marine mammals can be reliably found. When the fish are scarce, so too are the seabirds and marine mammals. Now, thanks to pioneering research on Atlantic puffins in Maine by the National Audubon Society, we know that climate change is impacting both fish and puffin chick survival. Coldwater fish in the Gulf of Maine, like the slender white hake which puffin chicks prefer, are retreating northward as the waters there get warmer, while the slightly larger and bulkier butterfish, a warm water species that is becoming more common, is brought to the chicks instead. Unfortunately, butterfish are too big for the puffin chicks to swallow so the chicks starve. Now, as far as I know, no research like this has been done in our waters, which are warmer than those of the Gulf of Maine. But in years when silversides and sand lance are scarce, fewer or larger fish are likely brought back to the colony for the tern chicks to eat. Some of those fish will be too big for the chicks to swallow. In those years fewer chicks survive to fledging. I have presented a very simplified scenario of chick survival, and nature seldom has one factor that explains chick survival and fledging. Two other factors include predators and human disturbance, and current management focuses on reducing the effects of these two factors. But climate change may change the abundance of small fish in our area, which may then affect our nesting terns. It is July now and once again things are shifting in the birding world. Bob Shriber, Lanny McDowell and Pete Gilmore found the first of our southbound migrants on Edgartown Great Pond on July 3. The most impressive of these was a breeding plumage white-rumped sandpiper. We see white-rumpeds every fall but they seldom are in their full breeding plumage. 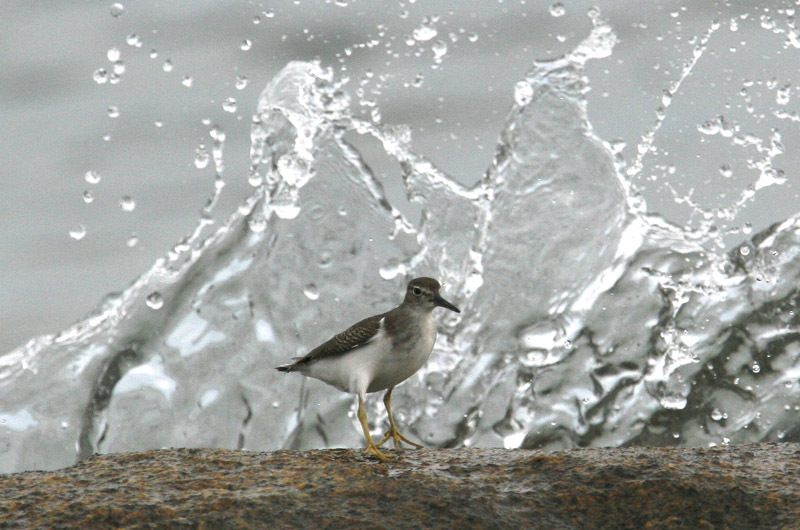 They also found a spotted sandpiper and a least sandpiper. 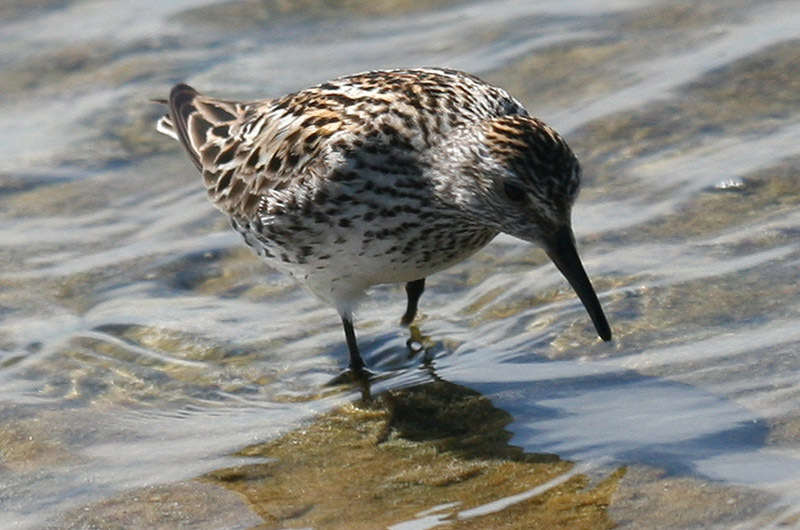 The arrival of these three shorebird species kicks off what many birders call fall migration. But summer just started and it is early July. Nobody wants to hear about that next season, no matter how glorious the fall may be. So I call it the southward migration. These same three birders also spotted an immature great cormorant in with all the double-crested cormorants. Greats are unusual at this time of the year although they are common through the winter. The immature plumages of these two cormorants are rather simple to separate as the great cormorant has a darker throat and a light belly, while that pattern is basically reversed for the young double-crested cormorants. On July 2, Mr. McDowell and Mr. Gilmore found a northern parula singing like mad at Fulling Mill Brook. Also on July 2, my guided birding tour went to Little Beach where we got great looks at our nesting willets, oystercatchers and piping plovers. All three species were agitated because several great black-backed gulls were perched on the beach. The willets especially were continually calling and frequently dive-bombing the gulls, though the gulls appeared unfazed by the ruckus. I also led a tour on July 1, where we went to Great Rock Bight to see songbirds. They proved hard to see in the dense foliage, but we heard American redstarts, red-eyed vireos, yellow warblers, common yellowthroats and blue-winged warblers as well as the ubiquitous catbirds, robins, goldfinches and towhees. Oddly enough, great-crested flycatchers were not seen or heard. I have not been hearing them around my house either. In Menemsha we found a green heron perched on the shores of the small pond behind the Home Port. Bill Post had a strange experience as he found an eastern meadowlark flying around inside his garage on June 29. Seems an odd location so far from a grassland. And finally, on June 29, Ann Lees found the surf scoter that has been hanging out in Quitsa Pond. The nesting season is winding down and the southward migration of birds has started. Go out looking for birds and please be sure to report your sightings to birds@mvgazette.com. 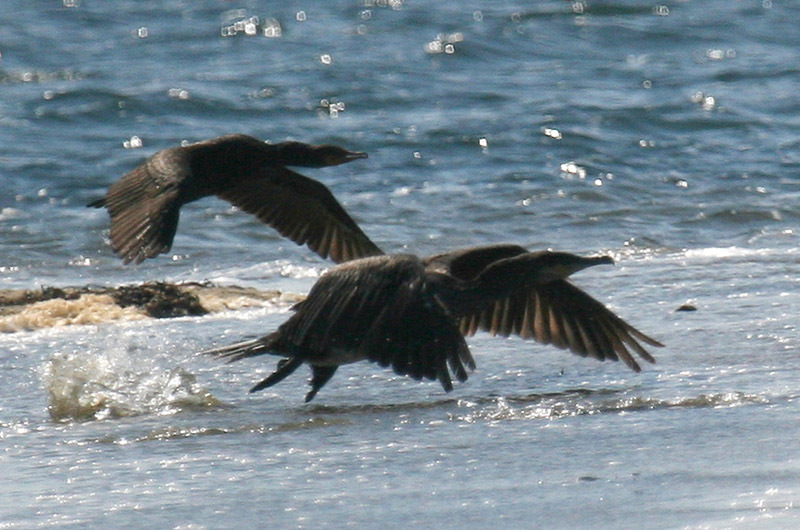 Photos of recent bird sightings on Martha's Vineyard.